This terrarium is closed, meaning I hope to strike the right combination of everything to allow it to be self-sustaining in a reasonably sealed environment. The LED is neither bright enough nor in the right wavelength to allow much plant growth, if any, so it will have to survive on indirect, indoor light. 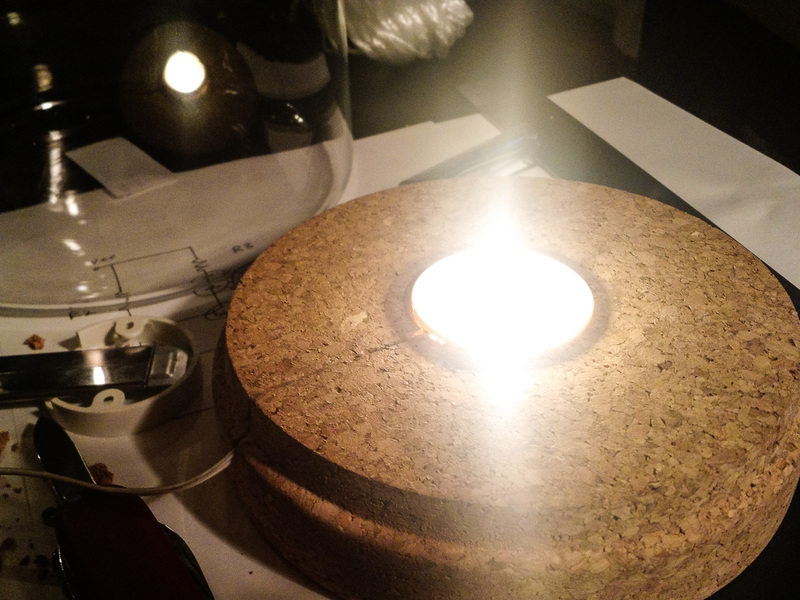 I traced out a circle in the centre of the cork board so that I could recess the Ledberg. 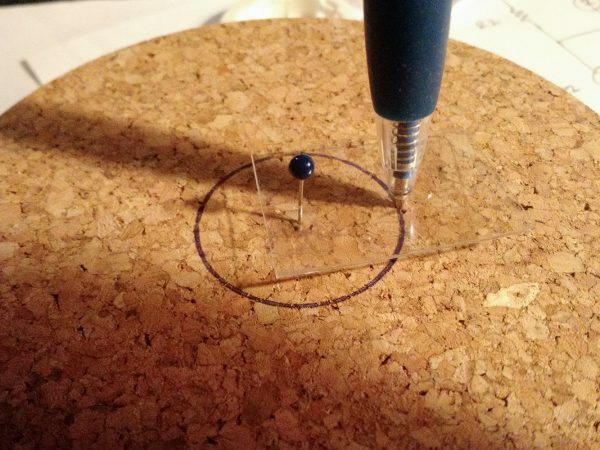 I’m travelling at the moment and so improvised a circle drawing template using some of the plastic IKEA packaging. 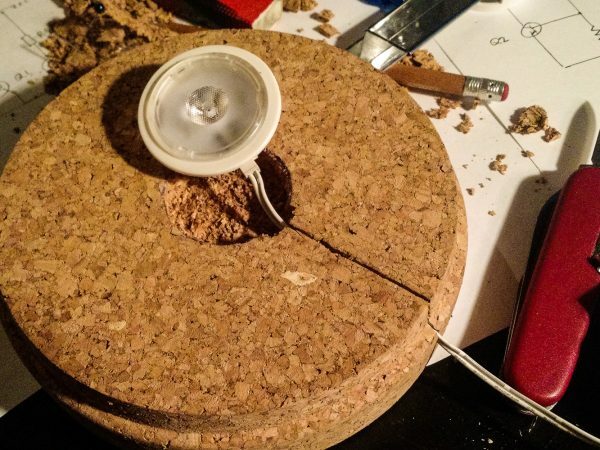 Cork is a pain to cut like this. The best strategy is to cut parallel lines to the right depth, spaced a few mm apart at perpendicular angles, and then ‘pop’ them out using a knife. I could have just screwed the ledare base into the cork but I wanted to take the time to recess it. 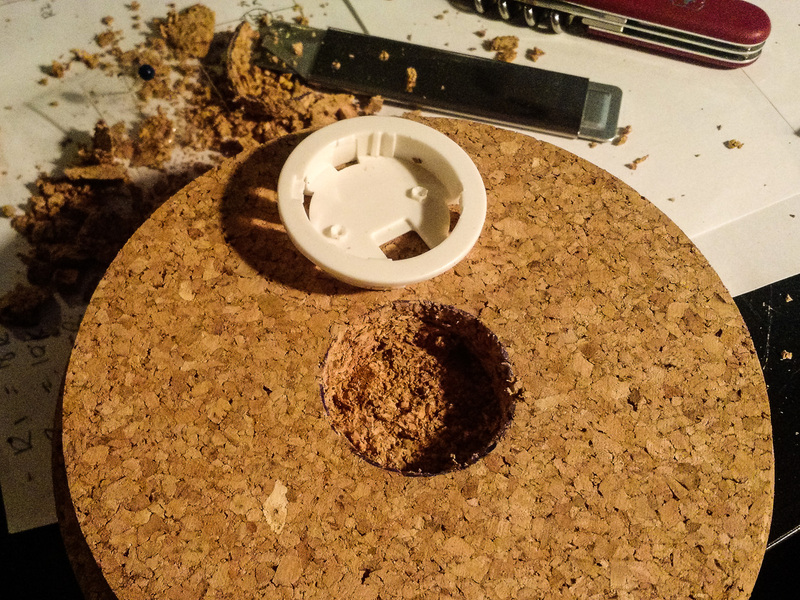 The power cable is just pushed into a slit that I cut in the cork. .. Then pull the power cable tight to mount the ledare. 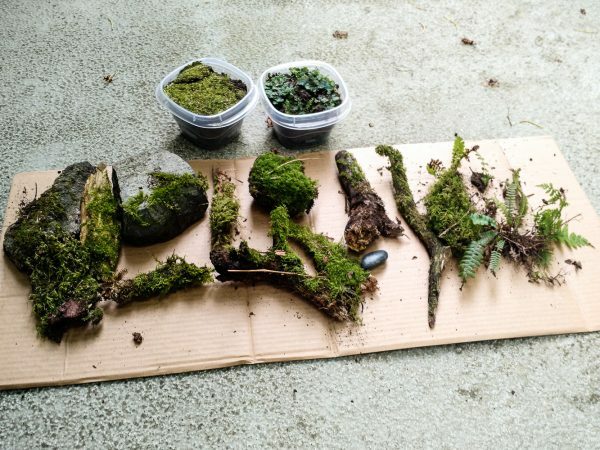 Next, acquire some moss and plants. From terrarium experiments in the past, I’ve learned that it’s much smarter to gather plants and mosses from the same area (and the same shade environment), so they’ll live together more harmoniously. It’s important to collect soil and organic matter from the same area, to more completely replicate the biome from that area. The most successful terrariums I’ve made have had only one or two varieties of flora in them, so I think it’s also important not to go overboard with different varieties. Don’t collect any moss that has little spore hairs on it – this moss is flowering or germinating (or whatever moss does) and will turn brown and die soon. Here’s my collection. Mosses can survive for a few weeks in a plastic container (with the lid on so they don’t dry out) and this is a good way to ‘test’ their hardiness. 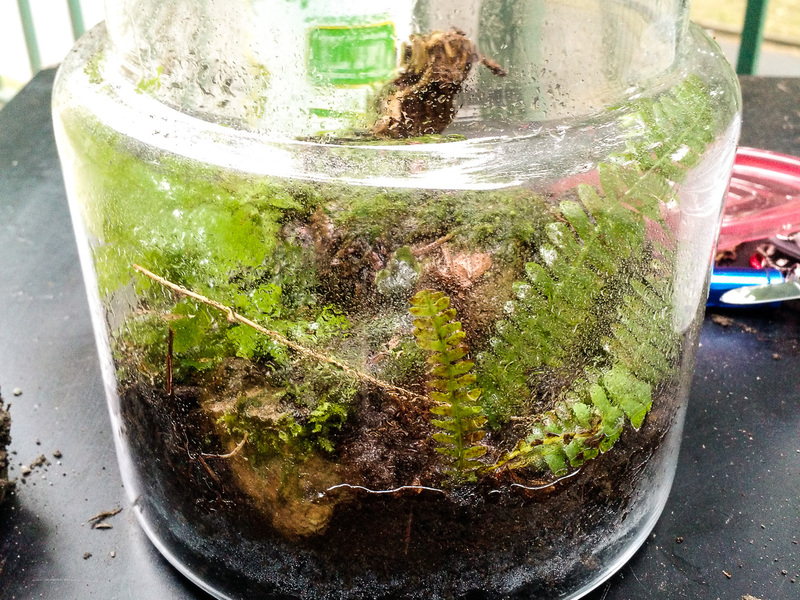 The container on the top right has some nice soil and some liverwort, which I’m giving a shot in my terrarium. I built a base of activated carbon and aquarium gravel. 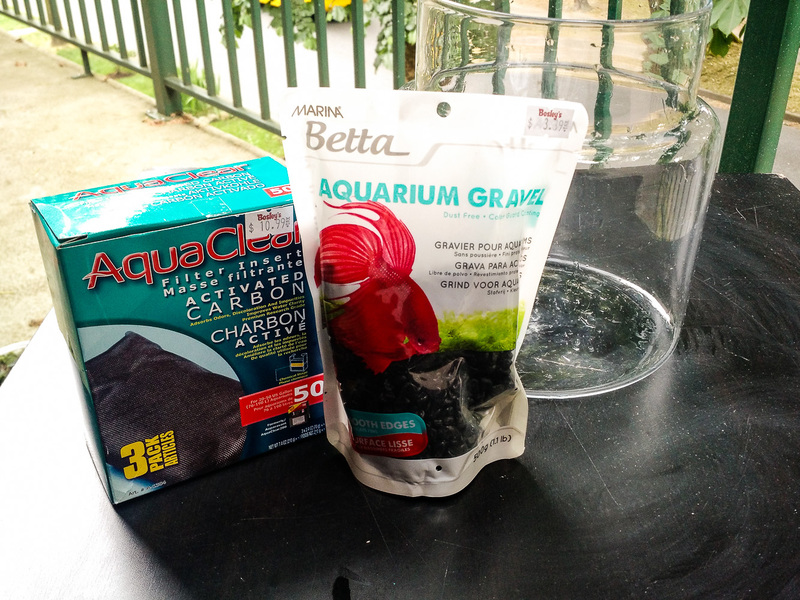 I couldn’t source cheap activated carbon anywhere so ended up buying some aquarium filters which I cut open. 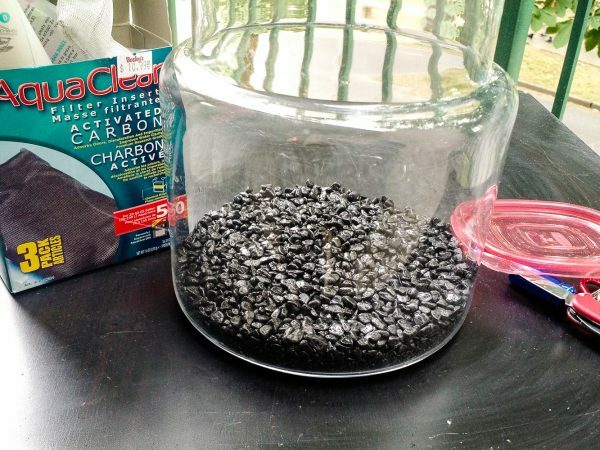 Activated carbon has been heated to increase its surface area and therefore its absorbent power. It supposedly controls odours and provides surface area for desirable bacteria to thrive. I laid down about 10mm of activated carbon, and then about 10mm of aquarium gravel. The order can be switched too, there doesn’t seem to be any difference. .. And then added soil and rocks. 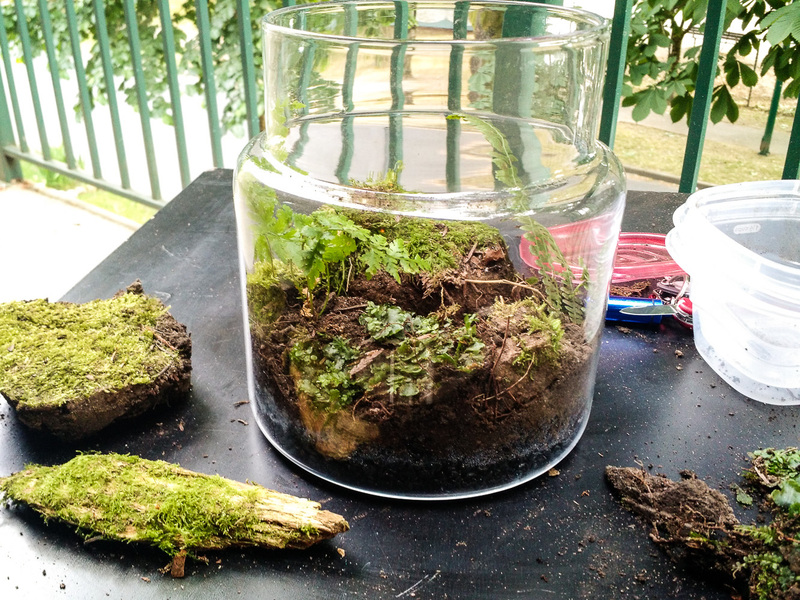 A rule of thumb (that seems commonly accepted) is that 2/3rds of the volume of the terrarium should be air. It’s also very important to listen to some deep relaxation sounds during this process. 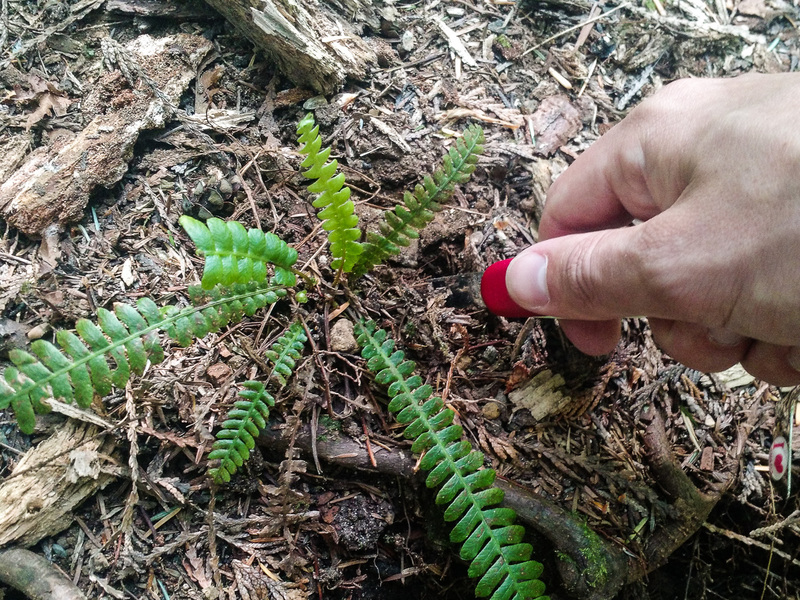 I give it a pretty good watering-down with a spray bottle, just to help everything settle and set. I usually do this a couple of times and leave the top off for a few days. There’s a lot of condensation. The first photo in this post was taken about three days after building it. For the week or two it will continue to look green and healthy but it will take a few weeks to know if it really ‘worked’. This is brilliant! Such a great idea. 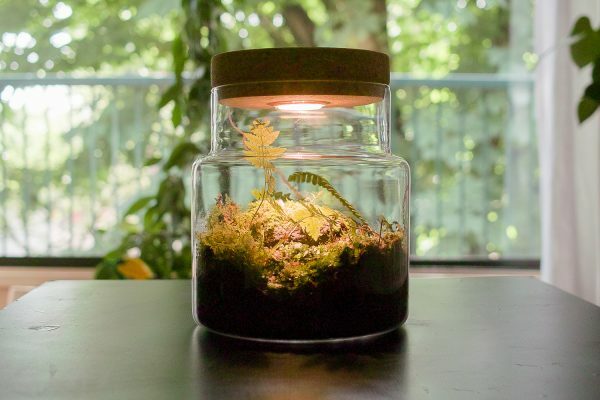 How did the terrarium do under the 3000k light? Hello, thankyou. The LED didn’t really seem to totally sustain the plant life and I had to keep it near a window. It lasted for at least a year (gave it away when I moved).